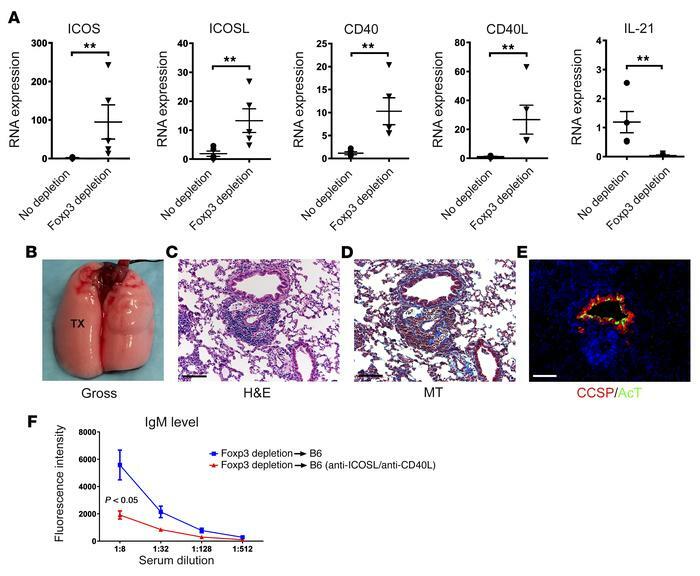 AMR of Foxp3+ T cell–depleted lung grafts can be prevented by blocking ICOS/ICOS ligand and CD40/CD40 ligand pathways. (A) Expression levels of ICOS, ICOS ligand (ICOSL), CD40, CD40 ligand (CD40L), and IL-21 in BALB/c lung grafts, which were initially transplanted into immunosuppressed B6 WT (CD45.2) (circles) or Foxp3-DTR B6 (CD45.2) (inverted triangles) mice and at least 30 days later retransplanted into DT-treated (days 0 and 1) B6 CD45.1 hosts. Grafts were examined 7 days after retransplantation (n = 5 each). **P < 0.01. (B) Gross appearance, (C) histological appearance (H&E), (D) MT (blue) staining, (E) and immunofluorescent staining of CCSP (red) and AcT (green) after depletion of graft-resident Foxp3+ T cells and 7 days after retransplantation into anti-ICOS ligand and anti-CD40 ligand–treated secondary hosts. Scale bars: 100 μm. (F) Serum titers of donor-specific IgM 7 days after retransplantation of BALB/c lungs, initially transplanted into immunosuppressed B6 Foxp3-DTR mice and at least 30 days later retransplanted into DT-treated WT B6 hosts that were treated with anti-ICOS ligand and anti-CD40 ligand (red) or did not receive treatment (blue) (n = 4 mice per group). Data are expressed as mean ± SEM. Mann-Whitney U test was used to compare the means.